A good citrusy scent is unbeatable for those mornings when you just can’t seem to muster the energy to lift your sleepy head from the pillow. It’s an energising, invigorating and fresh smell and if combined with a hint of spice then it’s in my shopping basket quicker than a New York minute. However, I’ve come to the conclusion that citrus is a tricky scent to capture… I’ve sniffed many ‘lemon’ products that quite frankly would be better kept under my kitchen sink than by the side of my bath. The Body Shop have just launched their Sweet Lemon range, I was given two products from the range at their recent presentation and as a veritable grumpy connoisseur of all things lemon-y… they’re up against a tough nose. A soap-free, non-drying cleansing gel with luscious lemon seed oil. Lathers to leave your skin feeling cleansed, refreshed, soft and subtly scented. The Sweet Lemon Shower Gel is nice, it definitely isn’t too synthetic smelling – it’s sharp rather than sweet and lathers up nicely. I’d like it to leave a little more scent on my skin, but for an “in shower experience” it does the job well. I think it comes at quite a price though… between me and Mr. L we’d get through 2 bottles of this a month easily, and I wish I could justify £12 a month on Shower Gel, but I can’t. If your skin isn’t sensitive to soap, I’d suggest trying out a bar of the Sweet Lemon Soap at a much more affordable £2 a pop. Light and fluffy, this quick-absorbing, non-greasy whipped cream lotion, with rich and velvety natural ingredients, smoothes easily over the skin, leaving it feeling well moisturised, soft and supple. Provides moisturisation that lasts up to 12 hours. Leaves skin scented with an uplifting and fresh lemon fragrance. The scent of the Sweet Lemon Whip Body Lotion (which again is sharp rather than sweet) lingers beautifully without being overpowering. The formula feels light and fluffy, sinking nicely into my skin without leaving any greasiness. I’m not sure how much stock I’d put into their 12hr moisturisation claims for this product as I personally need something heavier to keep my skin supple for that length of time. I’d give the scent of the range a 7/10 but it really appeals to Mr. L’s nose, and he never gives a crap about stuff like this… so it’s definitely a product I’ll be shopping for when my current one runs out. As it spreads so smoothly, I don’t think I’d need to repurchase too often either… well, not unless I catch Mr. L at my bottle again *side eye*. 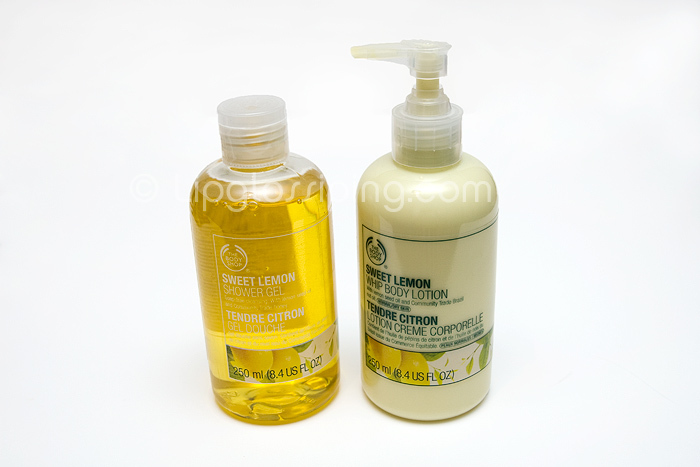 Have you tried the new Sweet Lemon range from the Body Shop? What are your favourite smells to get you going in the mornings? Bacon doesn’t count. I love the smell of peppermint in the morning for my shower gels, especially a really strong one. I’m in love with lemon-y scents. I was in TBS yesterday and was sniffing this stuff with abandon. I can’t justify the cost right now, really. But will probably get it at some point. I love lemon smells so I’ll have to check this out. At the moment I’ve just got the Lemony Flutter cuticle cream from Lush, which I mix with olive oil and use pretty much everywhere. I just like fruity scents in the morning and at the minute I have both cherry and papaya ones in the shower. TBS quite often have 2 for 8 quid (please excuse my use of the word “quid” but this keyboard doesn’t appear to have a pound sign) which makes them more reasonable.